Fitted kitchen - how to add character to your kitchen! Your fitted kitchen is the heart of your home. If you feel like the room is missing something that can really knock you for six, then you want to change that as soon as possible. Here at Starplan, we’ve seen kitchen trends come and go and we’ve come up with some timeless tips to add that much-needed character to your kitchen. One simple and easy way to add another dimension to your kitchen is through the use of fresh plants. You could have basil, thyme or lavender dotted around the room, so not only would it add character, it’s also practical as you could use it in your cooking! However, if plants aren’t your thing, fresh flowers are a much easier option with none of the hassle of trying to keep them alive for as long as possible. Why not add in different textures? Things like wicker and wood accents are a simple yet very effective way to add a sense of character and homeliness to a kitchen. Reclaimed wooden furniture is very ‘in’ at the moment and it can be the perfect way to break up a mundane feel of a fitted kitchen. Wicker baskets are also ideal as a form of storage in the kitchen whilst still looking stylish. If you have the space in your kitchen, add a seating or dining area. You can flow the kitchen and dining area together, whilst making sure they are still their own separate areas. It’s also a way to be able to spend time with family and friends while you’re busy in the kitchen. If this blog has given you some kitchen inspiration, then we are glad to be of service! 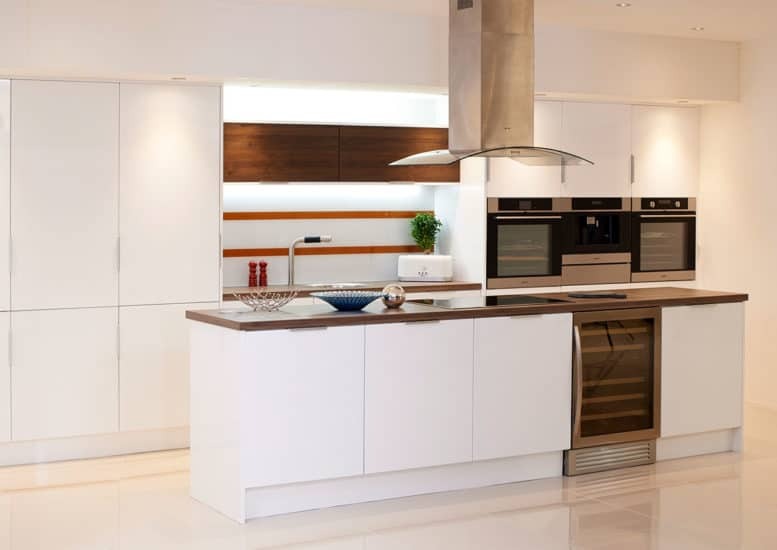 However, if you do need any more help, whether it be about fitted kitchens or any of the other services that we provide such as fitted bedrooms, sliding door wardrobes or beds, then don’t hesitate to get in touch with one of our team!